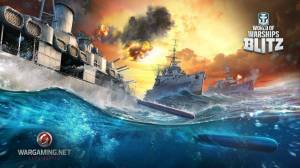 World of Warships Blitz is a free-to-play 3D Naval combat MMO that is based on the award-winning PC game of the same name. This World War 2 stratey game is easy to play and offers plenty of options to unlock that includes a roster of 90 legendary warships from Germany, USA, Japan, and the USSR. You can upgrade your ships and equip them with a variety of tools such as first aid kits, camouflage, and bonuses to help you succeed in combat. Gameplay is similar to World of Tanks in that instead of a tank players are the captain of a warship which they pilot across the seas in search of enemy ships and then use the arsenal at their disposal to take them down. Unlike similar games in the genre World of Warships has no timers, energy bars, or fuel restrictions so you can play as much as you want and whenever you want. Fight in real-time matches against other players, using deathmatch and point capture rules. Pick a ship to best suit your playstyle, including: cruisers, battleships, destroyers, and more. Enter the game's campaign mode at level 12, or queue up for AI, ranked PvP, or quick PvP battles. What are the Ship Classes? What are the Shell Types? What is the Game Currency? What is the Best Ship? No discussions open for World of Warships Blitz at the moment.